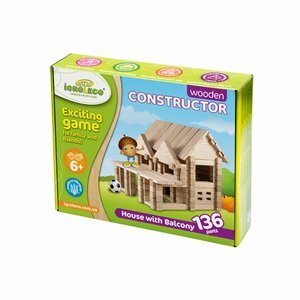 IGROTECO House with balcony construction set is an advanced level wooden construction set consisting of 136 elements for individual assembly of a house with balcony. This set includes more elements than other sets. It allows you to transform this model into new complex objects and anything you can imagine, for example, a plane or a truck. This construction set serves as a wonderful alternative to rubber, plastic and plush toys. It is made of carefuly polished natural wood (oak) without any artificial paint and glue, which makes it absolutely safe. Wooden elements are universal, they help to develop fine motor skills, imagination, and learn the basics of geometry. Different types of these wooden DIY sets are compatible with each other. Construction set is made of eco-friendly and safe material. Helps to develop fine motor skills, imagination and learn the basics of geometry. Various types of sets are compatible with each other. wooden parts — 136 pcs. Illustrated user guide — 1 pc.